Museum hosts kid's food festival, very hungry caterpillar story time and summer camp kick off. Who’s hungry? Stepping Stones Museum for Children is nourishing kids’ bodies and minds with food-focused events in June. First up is the Kid’s Food Festival on June 10. Then on June 16, everybody’s favorite caterpillar once again eats its way through the pages of The Very Hungry Caterpillar. Last but not least, dads will get a sweet treat of their own with free admission on Father’s Day, June 18. “Our exhibits not only feed children’s imaginations, but we incorporate healthy eating into many of our activities to instill good habits at a young age,” said Rhonda Kiest, CEO and President of Stepping Stones. Teaching families how to make balanced food choices is the mission of the museum’s first ever Kid’s Food Festival! Making a stop on its national tour, Creative Kitchen Kids Food Festival To-Go brings their signature activity, the Balanced Plate Scavenger Hunt, to Stepping Stones. The event aids in the prevention of childhood obesity through programming that’s simultaneously fun and educational, supporting the concept of learning through play. Upon completion of the Scavenger Hunt, families are rewarded with a Prize Pack. The initiative is in partnership with Parents and Family Fun magazines and the Association of Children’s Museums. Visitors can also experience the traveling Healthyville® interactive exhibit to learn about health and wellness. At The Very Hungry Caterpillar Storybook Pajama Party from 5-8:30 p.m. on June 16, kids will love watching the beloved caterpillar eat lots of colorful food on its way to becoming a beautiful butterfly. Children can wear their PJs to enjoy an evening at the museum and a compelling reading of the tale in front of a large screen showing the pages in the book for all to see. After the story, the reading is brought to life when children meet the storybook character. Hands-on themed activities for children of every age take place all evening throughout the museum. The Stepping Stones Cafe will be open during the event and be serving up some specially-themed items for purchase. The museum will close at 4 p.m. in preparation for this special event. Early-bird pricing for Storybook Pajama Party tickets is available until June 9 for only $10/person for museum members and $15/person for non-members. After June 9, the price is $12/person for members and $17/person for non-members. Children under the age of 1 will be admitted for free. Tickets are non-refundable and non-transferable. Registration is required. Space is limited. But the fun doesn’t end there! Stepping Stones has one more sweet surprise on Father’s Day. The museum recognizes that many special people may play the role of dad in children’s lives, and that “dad” can mean different things to different people. That’s why, for the first time ever, one caregiver per family gets into the museum in Norwalk at no charge on June 18 – not just dads! The museum also offers summer camp programs starting on June 19th that not only encourage fun and creativity but also help ensure young children remain engaged in the learning process. Dinosaurs, robots, and astronomy are just a few of the exciting themes campers can explore each week. “The goal is to give more school-age children an enriching summer experience in an effort to avoid the ‘summer slide’ that can happen when there is a gap in structured learning,” said Kiest. The program for children ages 5 – 8 years old runs Monday through Friday, starting June 19. Half-day sessions are from 9 a.m. – noon and full-day sessions from 8:30 a.m. – 3:30 p.m. Full-time, part-time and daily camp programs are available. Call to learn more about pricing, discounts for siblings, and multiple week discounts. Stepping Stones also offers field trips for camp groups in grades K-5. Campers enrolled in other programs can explore award-winning, hands-on exhibits and programs designed to ignite a love of learning through play facilitated by a museum guide. For information about all of these events and more, visit the Stepping Stones website. 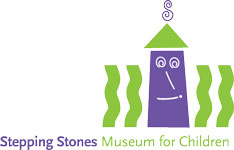 Stepping Stones Museum for Children is an award-winning, private, non-profit 501 (c) (3) children’s museum committed to broadening and enriching the lives of children and families. For more information about Stepping Stones, to book a field trip or schedule a class, workshop or facility rental call 203-899-0606 or visit http://www.steppingstonesmuseum.org. Stepping Stones Museum for Children is located at 303 West Ave., Norwalk, CT, exit 14 North and 15 South off I-95. Museum hours are: Labor Day through Memorial Day, Tuesday-Sunday and holiday Mondays from 10 a.m. – 5 p.m.; and Memorial Day through Labor Day, Monday-Sunday from 10 a.m. – 5 p.m. Admission is $15 for adults and children and $10 for seniors. Children under 1 are free. Get social with Stepping Stones on Facebook, Twitter or Instagram.